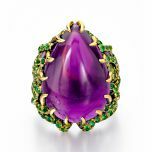 Each amethyst is over 25 carats. 202 tsavorites on each earring. Earrings in the royal colors of purple and green. The creeping, thorn-like prongs convey the way Marie Antoinette was drawn into a frightening situation not of her own making. Recommended reading: Wendy's Jewel of the Month blog post. Only one pair available for immediate delivery.